“Time is the healer of all wounds” rings true when a leader tries to change the culture for the better. But there is more than time involved in working to move organizations like school districts forward. School leaders must take action when charting a new course for a district. Roland Barth emphasizes just how difficult culture change can be in a 2002 issue ofEducational Leadership,”Probably the most important- and the most difficult- job of an instructional leader is to change the prevailing culture of a school.” But he also declares the interdependency between culture change and reform when he says, “A school’s culture has far more influence on life and learning in the schoolhouse than the president of the country, the state department of education, the superintendent, the school board, or even the principal, teachers, and parents can ever have.” Culture change is a vital reform tool! So, what does work to change a school’s culture for the better? I propose positive culture change comes down to two simple things: teacher leadership and sincerely dedicated professional support and guidance. People who feel vested in the change process (they can make real decisions, influence leader’s opinions, and develop long-range action plans that they are assured will be implemented) will come along with a leader as long as they see the fruits of their labor. Empowered people have a hard time saying no to the individual who is willing to share his influence and decision-making capability. 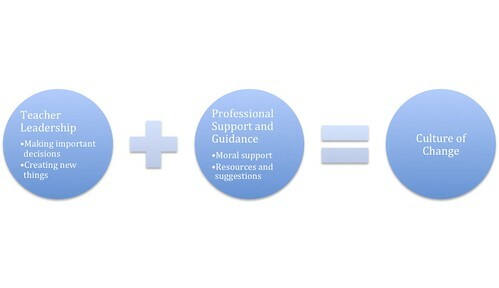 Professional support to help those vested with decision-making powers realize their decisions and see them come to light will show those decision-makers that the leader means what he says and what he does- he is willing to collaboratively lead the organization with his constituents because he will support their efforts, financially, morally, and via professional development. Knowing one has the capacity to change an organization is a powerful force that, when provided to teachers can help build a positive energy mass that will support the leader’s attempts to improve the culture and install reforms necessary to promoting student achievement.